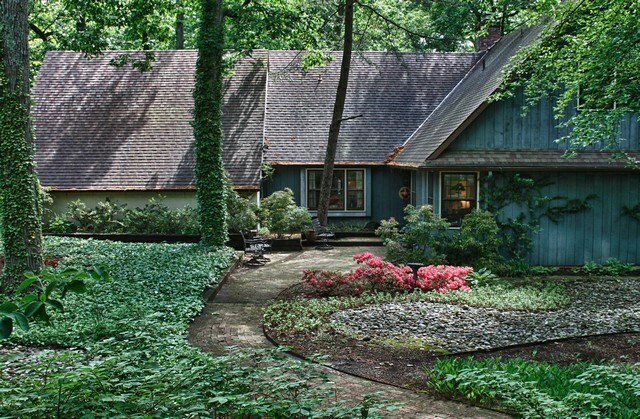 Since I plan to relocate in the coming months I am particularly sensitive to this spring and what spring has brought to my life all the years in this house. It has always been a favored season of mine beginning with the slight, tentative, feathery foliage of the emerging tree leaves. Soon the leaves are full and painted against the sky leaving only moving swathes of light here and there. Then the dogwoods appear up and down the streets. Saturated pinks and whites, the richest of which was given to us years ago by a friend and planted by my late wife, Marty Lou. Next arrive the wild violets, the vinca, and the delicate and fragrant lily-of-the-valley, again all planted by Marty, sometimes to my regret as I have had to fight their invasive tendancies. My daughters would pick lily-of-the-valley, resulting in crushed bouquets for Mother’s Day. Now I invite the little girls across the street, Sophie and Chloe, to do the same. A neighborhood friend (a friendship as old as the house) would also pick a bouquet every spring; she is not well and her bouquet was unpicked this year and I’m sad about that. The kids have moved out, friends leave, I’m leaving. But the lily-of-the-valley remain and there are seasons to come. I think that’s nice. 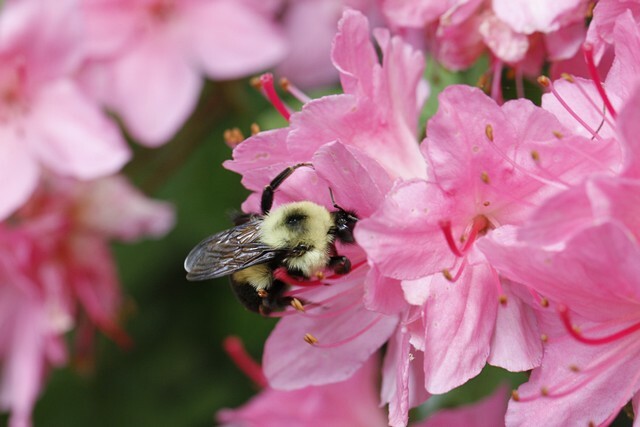 Next on the spring schedule are the delicate wild azaleas. I have a half dozen of them on the grounds; they were here in the woods before I came along and they survived the house construction. They’re not as splashy as their hybridized cousins; they’re quietly understated and quite satisfied with that, thank you. As the wild azaleas finish their show their splashy cousins begin to emerge and what a pleasure they are to the eye. Here’s one having its purpose helped by a honey-maker, a mutually beneficial relationship. 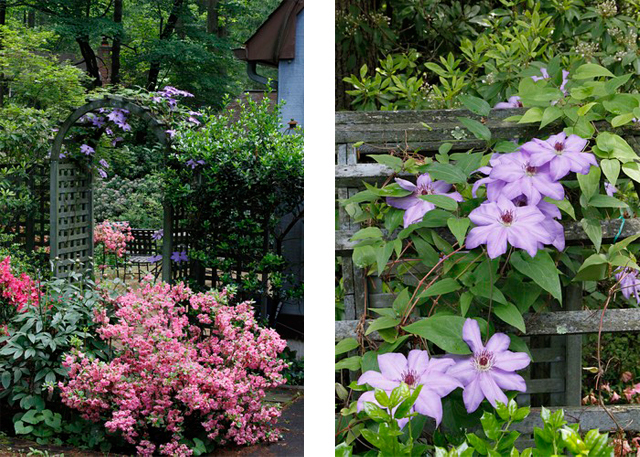 After the azaleas have peaked my clematis shouts “Look at me now; I’m beautiful.” Talk about a saturated color. They’re growing on the arbor Marty had me erect to give the back patio some isolation. I don’t sit out there much anymore but it’s a nice feature. 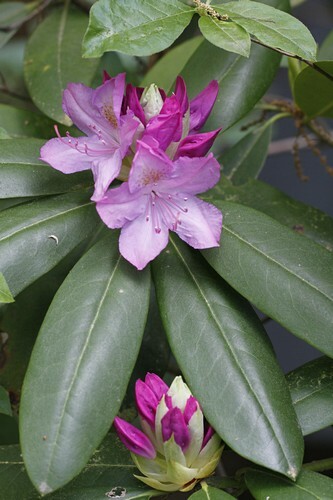 About this time the first of my rhododendrons open their blossoms. Last winter they were arched to the ground under ice coats on shriveled leaves. They survived and I’m now enjoying lots of lush, rich colored bloom. Moral: Hang in! 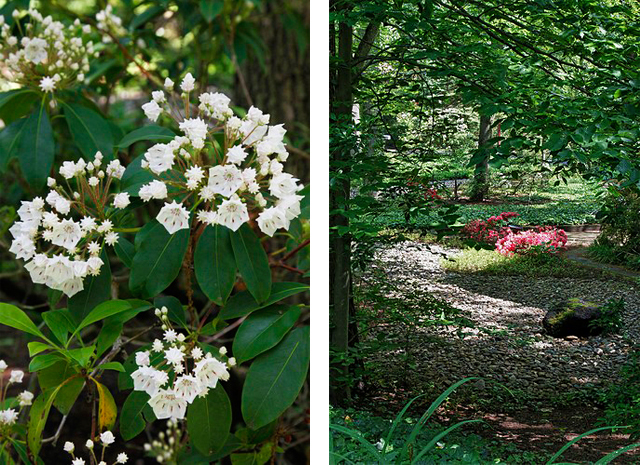 Next and bountifully beautiful is the mountain laurel blooming every year around Memorial Day. The amount of bloom varies from year to year, seeming to peak every two years. When it does it forms a canopy on the thicket alongside the house, almost a blanket of these exquisite miniature umbrellas. 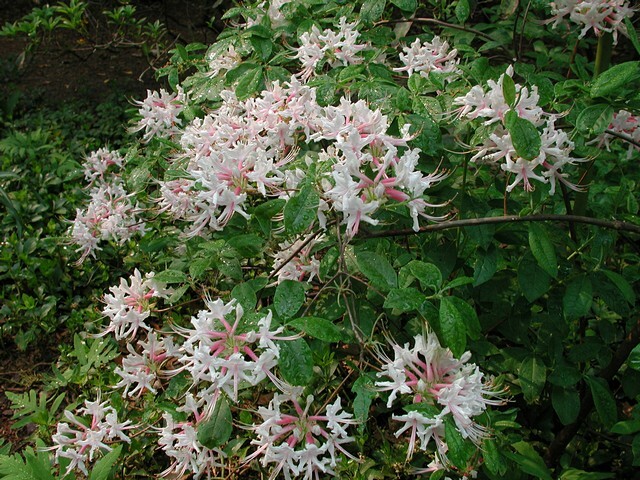 The thicket comes right up to my bedroom window and I’m greeted by armful-sized bouquets. 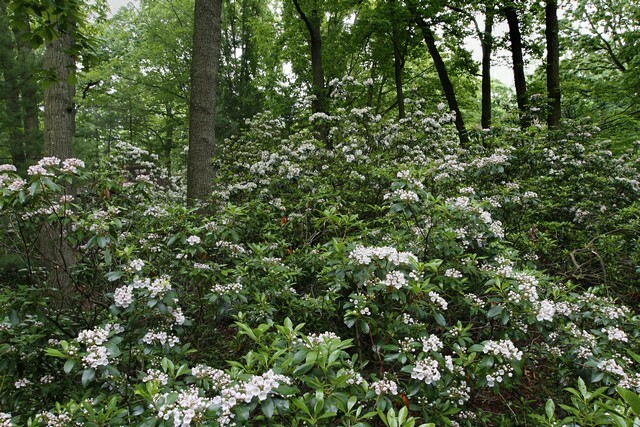 A blanket of mountain laurel. I enjoy a coffee while taking all of this in on the front patio, remembering how the girls hauled the bricks to the work area and I laid each and every brick. I walk about and see the tiny blossoms on the holly trees, some already fruited, and the flower heads of the pyracantha, both promising flashes of red in the fall, both saying “There’s a future.” The Nantucket Rose which Marty dragged back from Cape Cod is blooming and, as usual, the aphids are enjoying it. While I’m truly excited about the next phase of my life at Medford Leas, I’m going to miss spring at Box Hill. But, just as the seasons progress, so must I, and I know spring will be just as beautiful all over the Medford Leas campus. I’ll tell you about it next spring. Ralph, a beautiful idea to photograph your lovely gardens at your home! Many years of TLC and hard work has produced quite a special place. Of course, it will be with you forever – wherever you are. Thanks, Claire. I’m glad you and Barbara enjoyed yourselves. I envied you enjoying the bay and wine from the roof deck. Wishing you all the best Ralph on your new journey. Beautiful photos and such an enchanting story!!! Thanks, Kathleen. I’m sure your grounds (the Longwood Gardens annex) are stunning again this year as well. Humble thanks, Mary Lou. I enjoy it and one hopes others do as well. Enjoyed seeing you and Ross at the fundraiser. We (!?!) at Medford Leas appreciate your largesse. By all means, you and Ross should join the West Bridlington Happy Hour Circuit.